Let’s take Coca-Cola (KO) through the fundamental process. 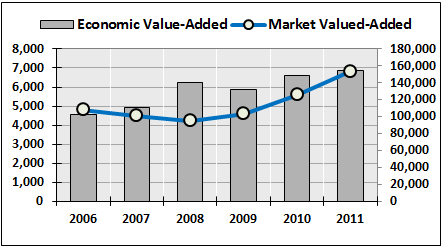 As always, we’re looking for above-average dividend payouts backed up by a track record of tangible value creation. The comparison company is PEP, which pays a strong dividend, but is far less globalized. 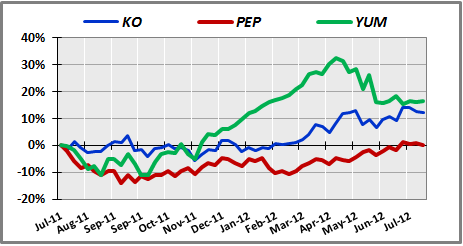 KO outperformed PEP over the past 12 months, and gained when YUM imploded in April. KO shows good average growth, but they are losing efficiency somewhere — total revenue grows faster than EBIT, NOPAT and dividends (although EPS growth is strong at 14.4%). 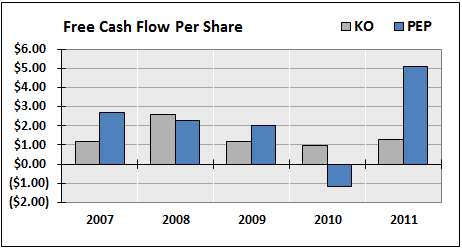 The sharp contraction in free cash flow indicates a loss of intrinsic value in recent years. Note how the large buildup in assets and capital have not produced proportional growth in revenue, profits and free cash flow. 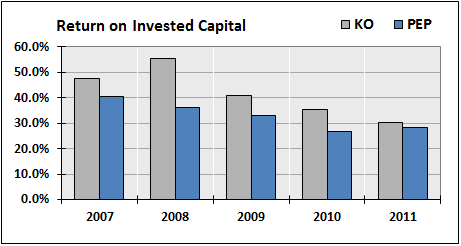 Incremental return on capital should therefore be falling (see below). 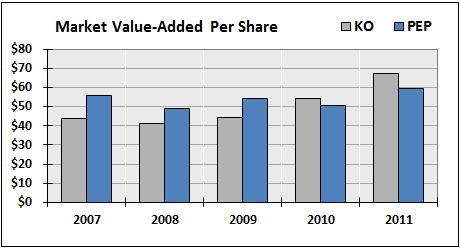 Moreover, the stock isn’t as attractively priced as a few years ago (as MVA grows 17% per year, but EVA only grows 3%). 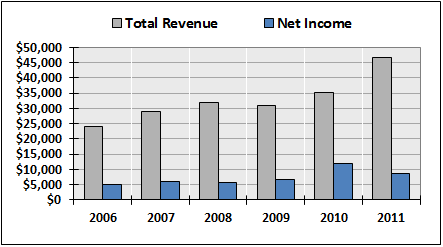 KO’s strong 2011 total revenue result makes its 3-year revenue growth look stronger than it might be. Note the slip in KO’s net income in 2011. 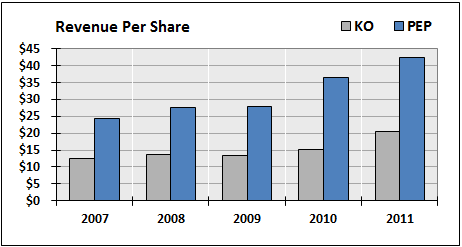 PEP generates more than twice as much revenue per share compared with KO. 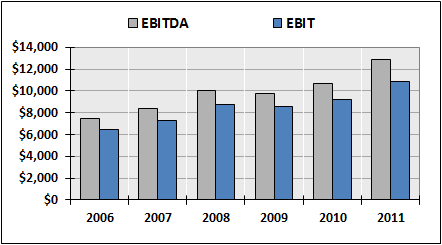 KO’s EBITDA and EBIT trend steadily higher. 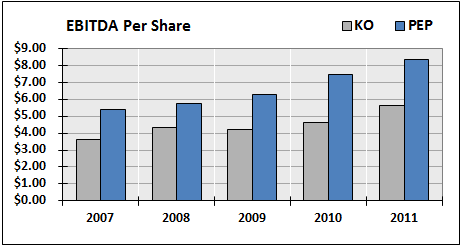 KO closes the gap with PEP in terms of EBITDA per share, but PEP still maintains an advantage. 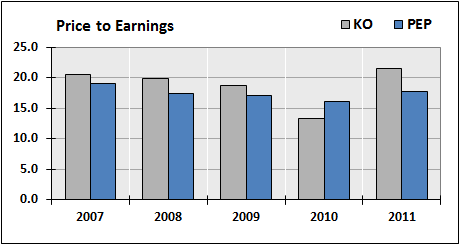 KO’s EPS decline in 2011, but they still manage to grow the dividend. 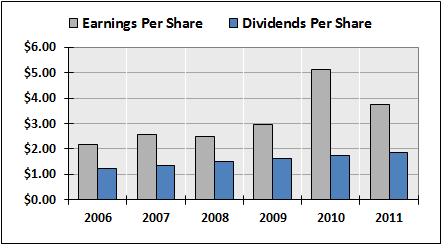 PEP has paid slightly higher dividends/share compared with KO since at least 2007. KO, having that stronger brand name and little or no exposure to low-margin snack foods, posts a higher operating margin than PEP every year. 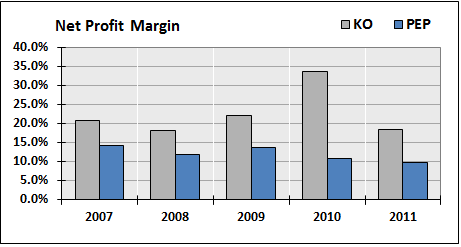 KO also has a consistently higher net profit margin. 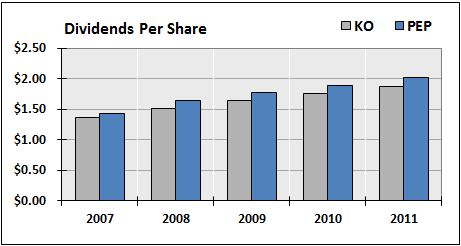 KO consistently trades at a small premium to PEP, but the gap in their P/E ratios grew in 2011. KO’s price looks a little extended. PEP has out-yielded KO for the past 2 years. 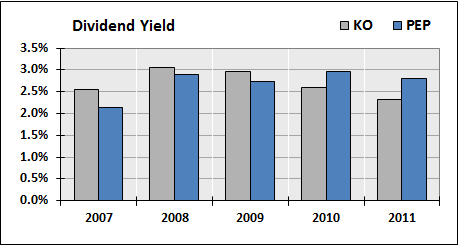 Both firm’s dividend yields are above average, however. 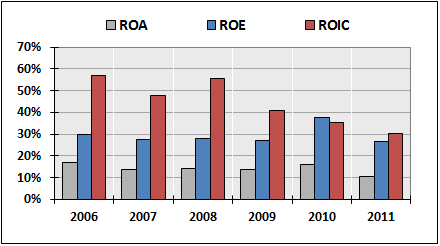 KO’s ROA slipped to 10% in 2011, and their ROIC is in a multi-year downtrend from a high of 55% all the way down to (a still respectable) 30%. KO’s ROIC has compressed down to the same level as PEP. Note that both firm’s ROICs have been trending lower in recent years. KO’s EVA and MVA expand proportionately. PEP has consistently generated more EVA/share than KO for the past 6 years. KO and PEP have had comparable MVA/share over time. We always use conservative assumptions when forecasting companies’ financial statements. For KO, we use the Capital IQ consensus growth for 2012 and 2013 of 3.4% and 4.3%, respectively, then taper to a long-term growth rate of 2.0%. 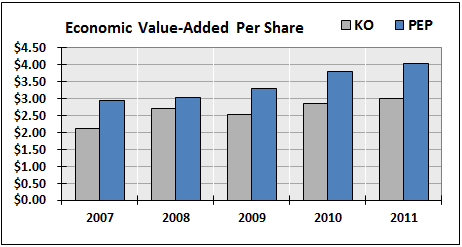 We grow dividends slightly below the historical average of 8.7%. 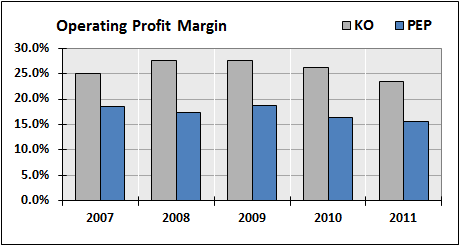 All pro-forma margins are compressed back to their 2011 levels. KO’s 2- and 5-year betas are both 0.53, which is quite low. We therefore bump up their pro-forma beta to 0.70. With a risk-free rate of 1.49% (yield on the 10-year T-note on 08.01.12) and a market risk premium of 7.0%, KO has a weighted average cost of capital of 6.0% (which is quite low). KO’s FCF is also assumed to grow 2.0% in perpetuity beginning in year 2016. 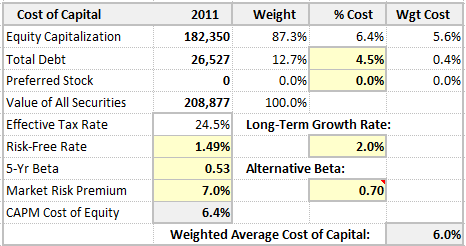 Based on these modeling assumptions, KO models up as slightly undervalued at its current price of $81/share. 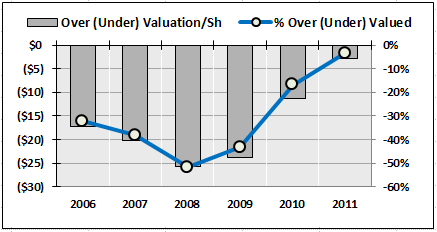 KO shows a profile of an undervalued stock whose price has been corrected back to fair value by the market since the financial crisis. In other words, KO’s price was taken down during the severe bear market of 2007-2008, despite the fact that the company suffered comparatively little interruption in its ability to grow revenues and generate fundamentals. 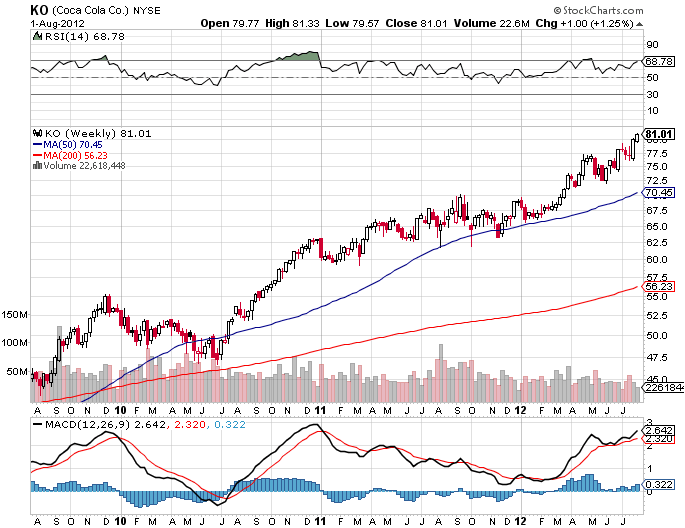 KO’s price of $81 remains solidly above its 50- and 200-week moving average. The relative strength indicator of 69 and MACD of 2.6 both corroborate that KO remains in a long-term uptrend. KO’s price is also above its 50- and 200-day moving average. It’s currently trading right at the top of its most recent price channel. 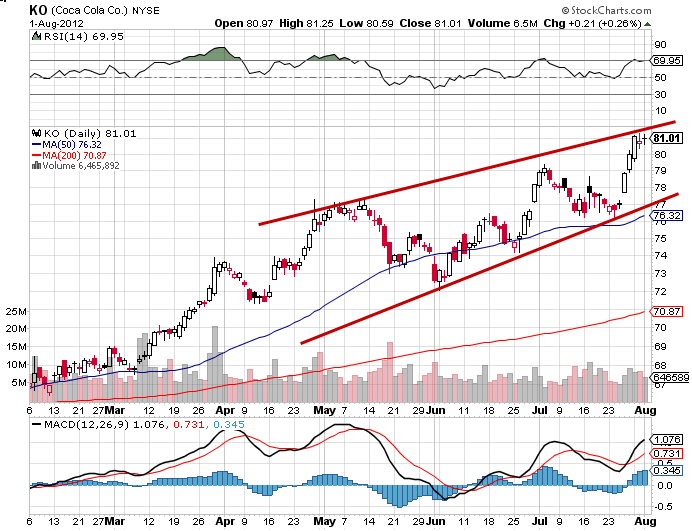 We like the stock at prices closer to the low- and mid-range of the channel, say $77-$78 per share. We think the last several dollars of KO’s price action has been juiced by central bank chatter regarding a possible third round of Quantitative Easing. Conclusion: KO has settled into a solid, if unspectacular, rhythm. In the choppy, correction-prone markets of 2010 and 2011, KO has produced steady positive results, earning it a below-average beta of 0.53. This low beta fuels an extremely low WACC of 6.0%, which helps KO’s intrinsic value, making it appear fairly-valued at its current price of $81. This earns KO a HOLD recommendation for existing owners. For prospective buyers, KO looks a little pricey compared with PEP. Selling in-the-money puts might be a good strategy for acquiring KO. Writers collect short-term option premium and can wait for the stock to come back into the mid- to high-70s, where it becomes more attractive.